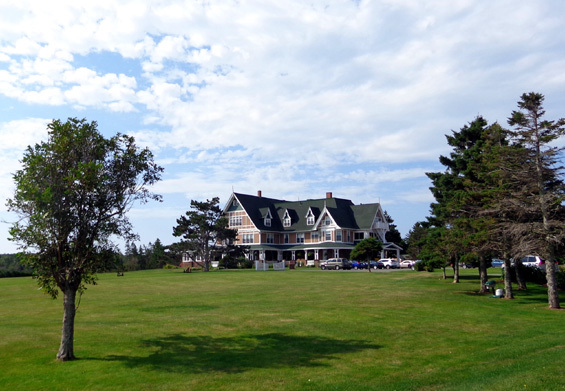 Green Gables House and Dalvay-by-the-Sea National Historic Site." 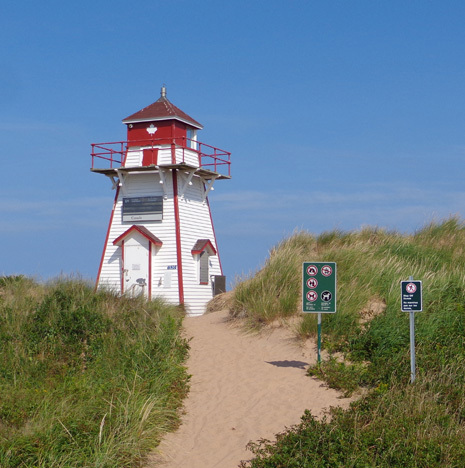 One of the reasons we wanted to spend a week on PEI was the opportunity to cycle and hike on some of the many multi-use trails that highlight the scenic wonders of this island. 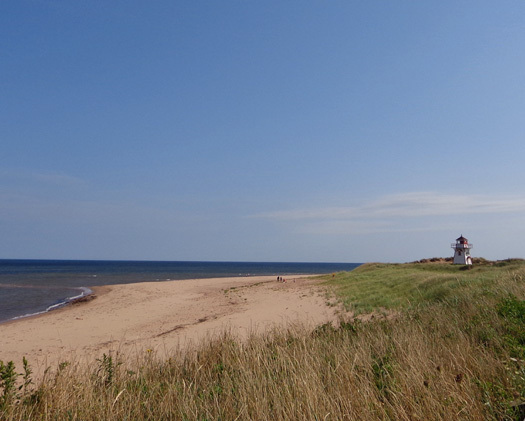 The weather was great today so we started in PEI National Park with the eastern part of the Gulf Shore Way seaside trail just a few miles north of our campground. 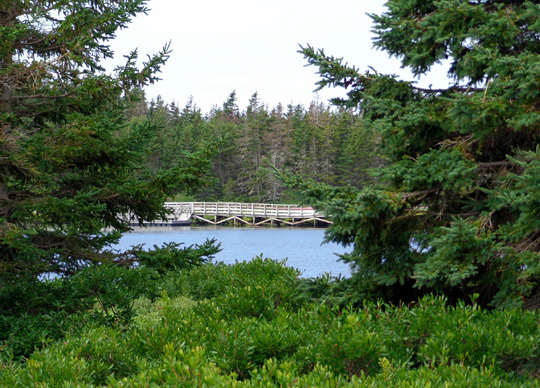 This paved hiking-biking path runs along the coast of the Gulf of St. Lawrence, part of the Atlantic Ocean. 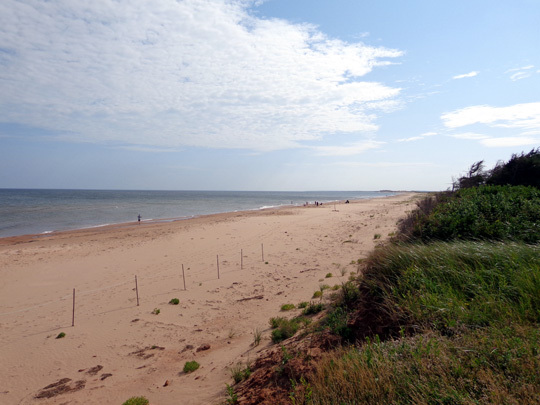 The national park protects an area of sand dunes, barrier islands, beaches, sand spits, and wetlands in three distinct units on the north shore of PEI -- Cavendish, Brackley-Dalvay, and Greenwich. This link to the park website shows the location of the three units. From that page you can pull up the trail maps in each section of the park. 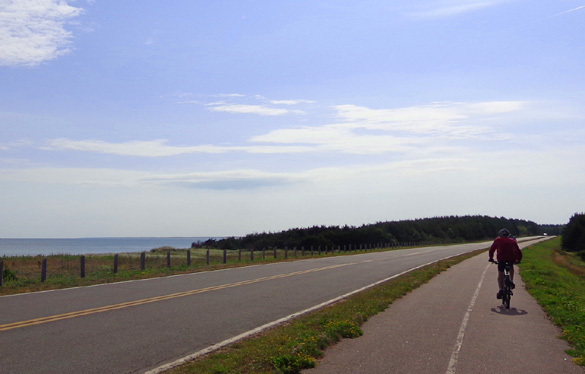 The Gulf Shore Way (for cycling and hiking) and the Gulf Shore Parkway (for vehicles) follow the coastline closely in the Cavendish and Brackley-Dalvay unit but do not connect between them. 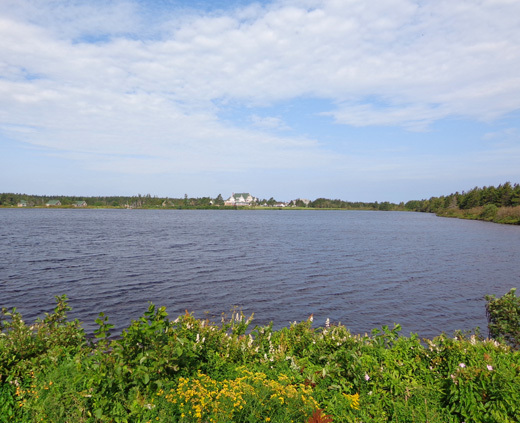 The Greenwich unit, which we did not visit this week, has other types of hiking and cycling trails. 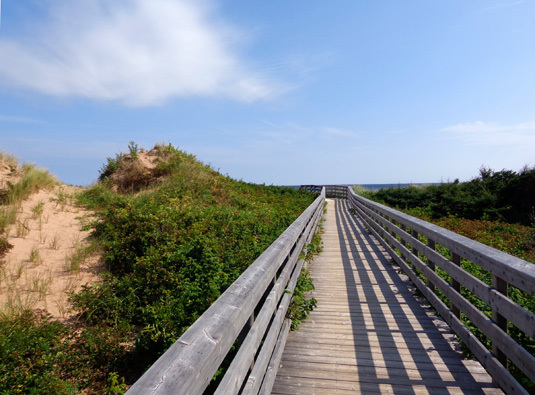 All three park units have beautiful sandy beaches, sand dunes, and coastal plants. 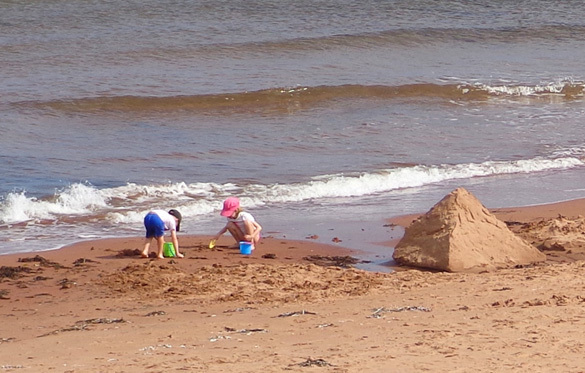 This morning we drove to the park unit that is closest (about six miles) to our campground, Brackley Beach. We found a parking spot half a mile inside the entrance, near the western end of the bike path. 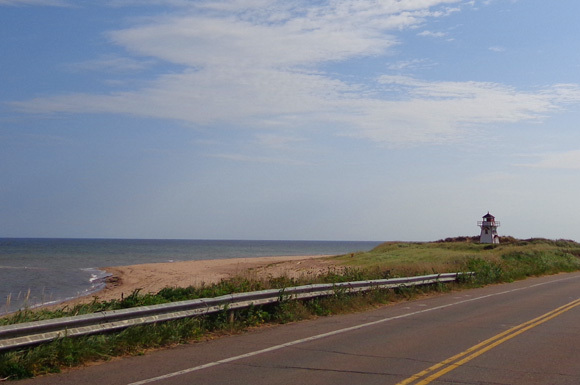 Visitor center and rest rooms near Brackley Beach; the 2-way bike path is next to the roadway. 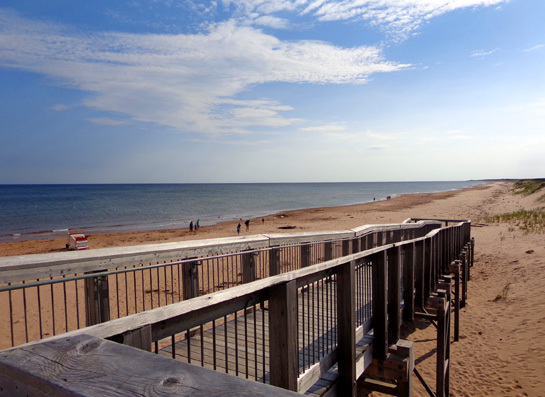 visitors can see the ocean from the resort but it's more "by the lake" than "by the sea!" We rode our bikes back to the unique Queen Anne Revival-style building but didn't go inside. 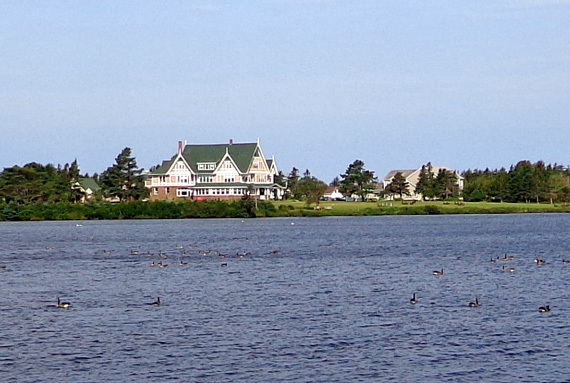 Gulf Shore Way is popular for cycling with both residents and visitors to the island. 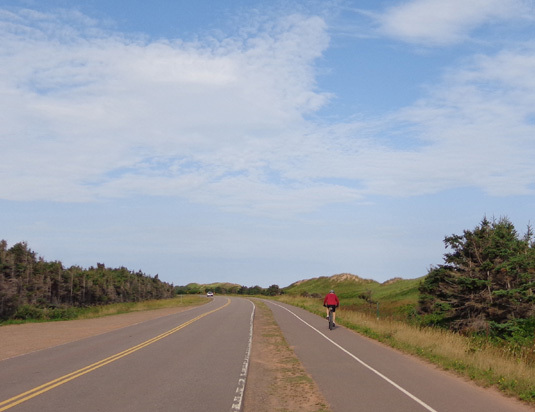 We chose to ride it first because it's one of the few bike paths on the island that lies this close to its coastlines. The bike path also lies right next to the parkway but traffic was light, the speed limit is low, and we were so mesmerized by the scenery that we hardly noticed any vehicles. It also helped that we rode this section in the middle of the week. 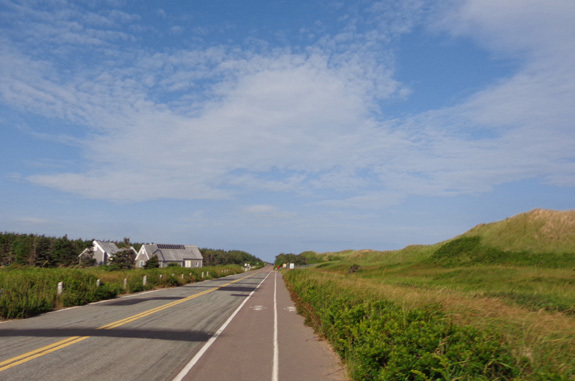 I imagine the road and bike path are busier on weekends. 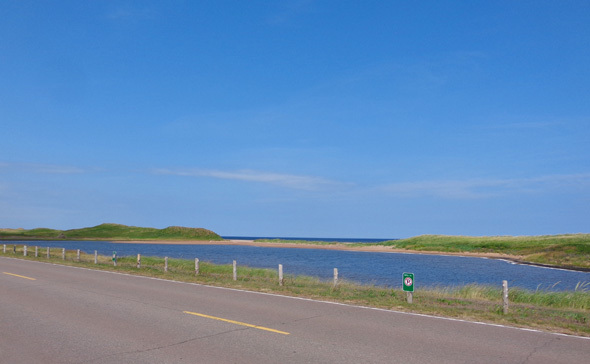 Sometimes the bike path was on the inland side of the road, as below, and sometimes between the road and shore. 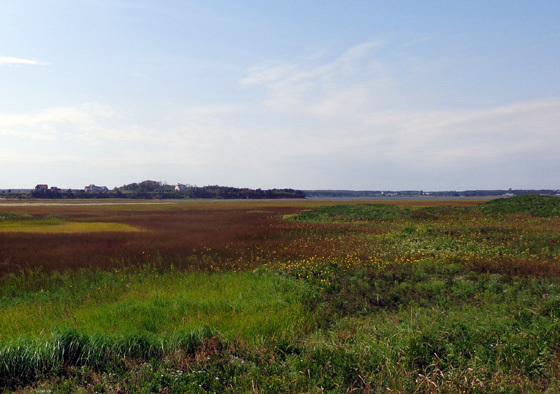 As you can see from these photos, we had views of the Gulf part of the time from the path. 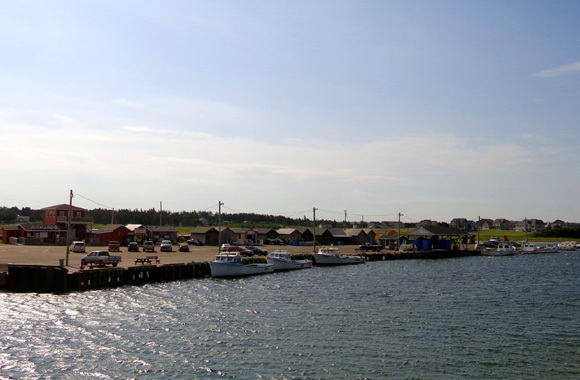 Conehead Harbor at the head of Conehead Bay; a bridge crosses the narrow outlet. 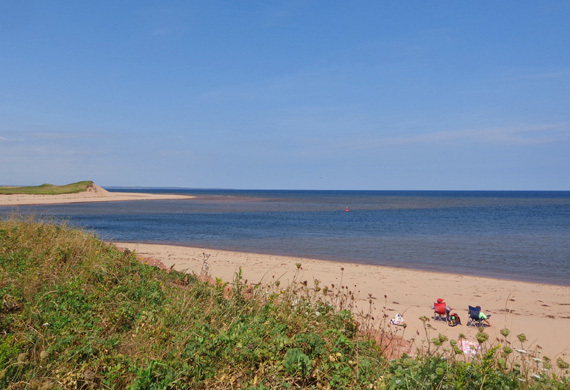 Two people relax on the beach between the lighthouse and the bay inlet/outlet. 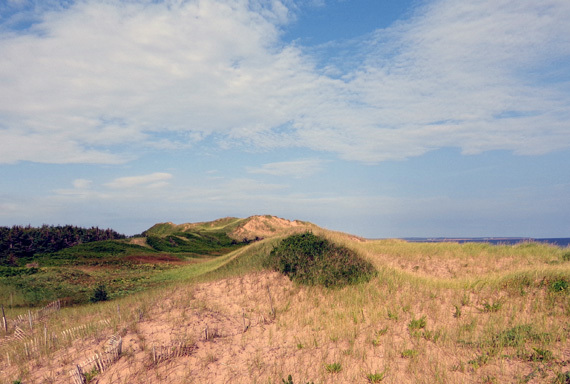 We rode into all the parking areas with beach access so we could get closer to the water and the beautiful sand dunes. 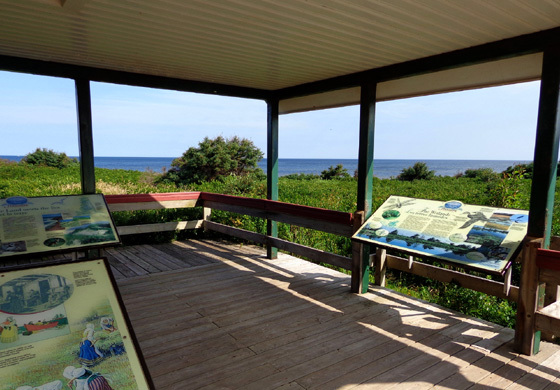 An overlook near Stanhope has restrooms and a nice, shady pavilion with benches and several interpretive panels re: early Native inhabitants, Scottish settlers, the natural coastal and wetland environment, farming and fishing industries, even rum-running in the era of Prohibition! 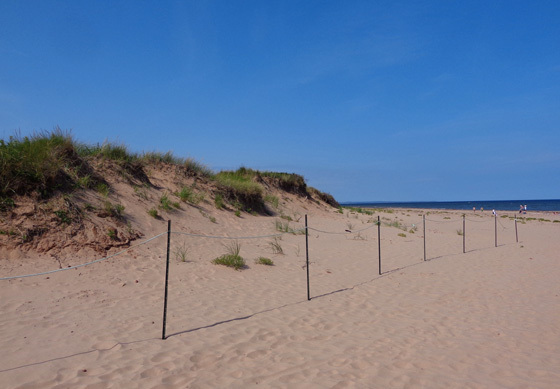 There is limited access to the national park's six beaches because of the fragile dunes. 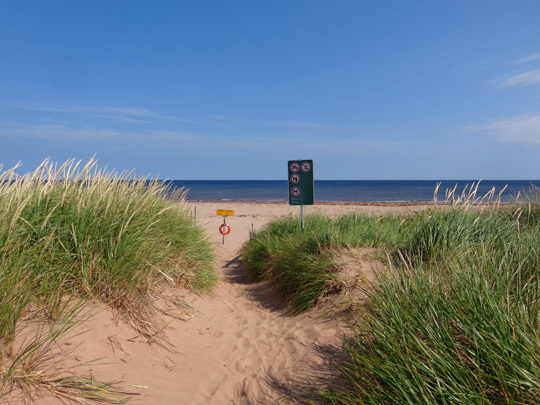 Signs warn that this is an unsupervised beach and say what is prohibited (pets, booze, fires, camping). 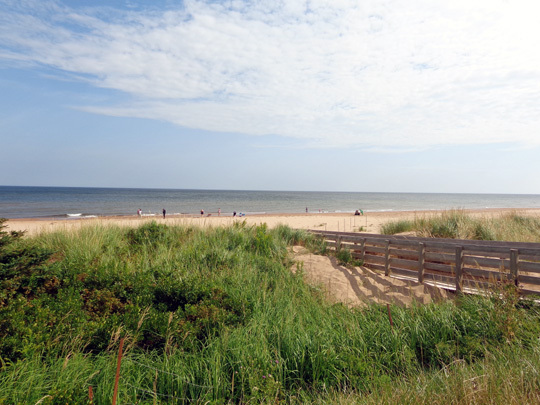 At one beach access point I sat on a bench on the cliff overlooking the ocean to eat a Clif bar. 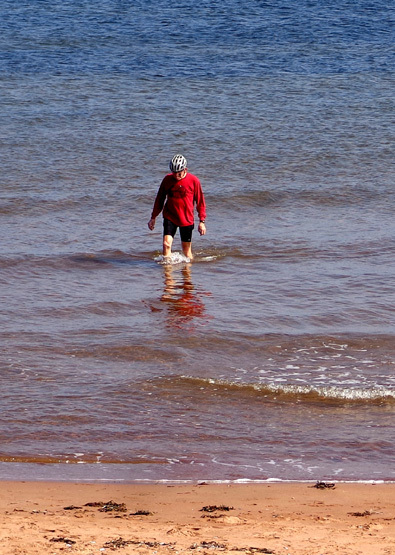 It wasn't real warm but because of the shallow "shelf" here, PEI claims that the water in its beaches is the warmest of any north of the Carolinas. 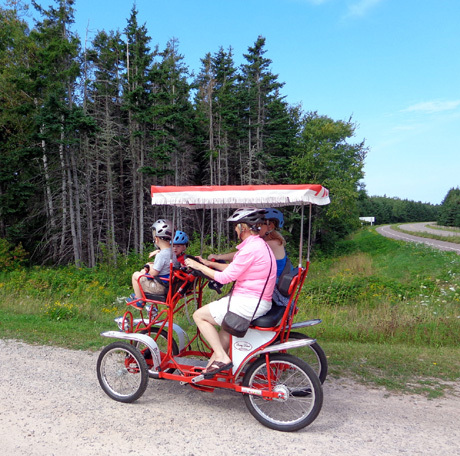 They aren't motorized; ya gotta pedal! 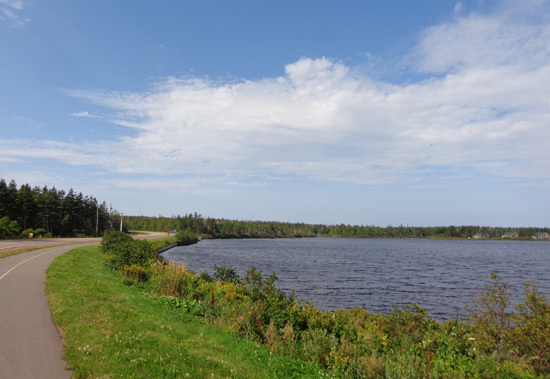 We really liked riding this trail on our own bicycles because of the gorgeous scenery and great workout we got. 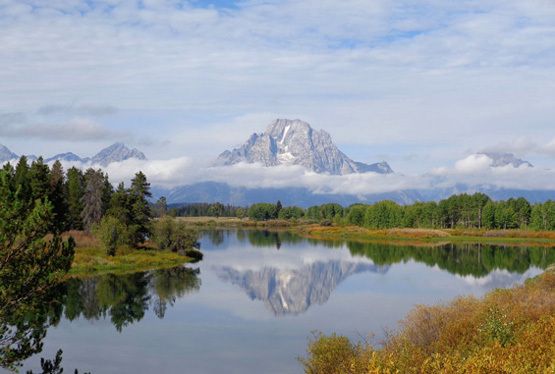 The weather was perfect and there was minimal traffic. Although we weren't always riding together, we both rode a total of about 18 miles (9 out, 9 back). 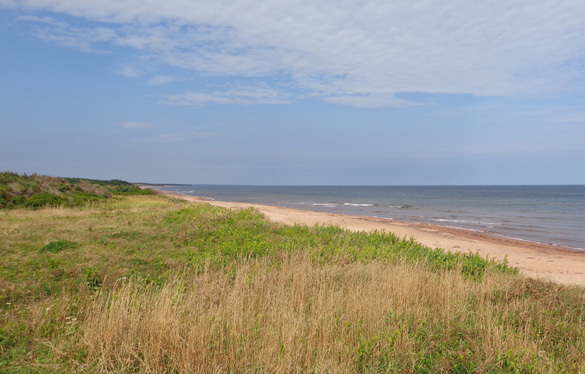 We also rode Gulf Shore Way in the Cavendish unit of the park. 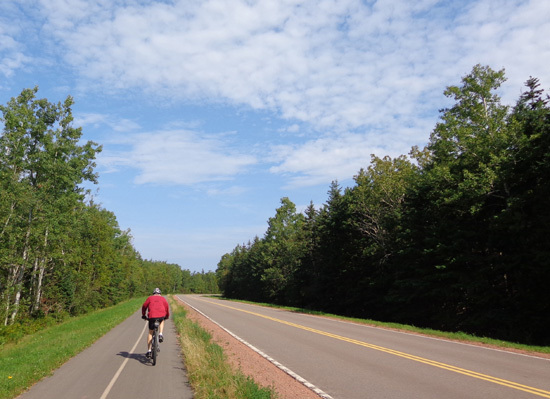 I'll feature photos from that segment in another entry, also dated the day we rode it.